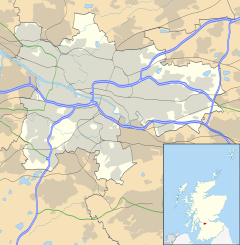 The Merchant City is a district in the city centre of Glasgow, Scotland. The medieval Glasgow Cross was located on the road between High Street and Saltgait. Its modern replacement was built to the south-east of the original location to aid traffic. The town's tron was placed on the steeple of the town house in the 1550s. The Tron Steeple, as it became known, still stands in Glasgow Cross, one of the few remaining pre-Victorian buildings in Glasgow. The area now known as 'Merchant City' was developed from the 1750s onwards. Residences and warehouses of the wealthy merchant "tobacco lords" (who prospered in shipping and, amongst other things, tobacco, sugar and tea) were built in the area. The district west of the High Street formed the historic backbone of the city, the development of what is now known as with wide, straight streets, vistas, and squares, marked the beginning of a process of aspirational residential movement westwards that would continue throughout the 19th century and into the 20th with the development of Blythswood Hill, Hillhead and the West End of Glasgow. 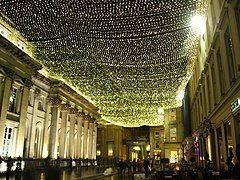 As Glasgow expanded in the 19th century to become the second city of the United Kingdom and the British Empire, the area became a working district of warehouses and home to the city's central fruit, vegetable and cheese markets. After plans to construct a ring road around the city centre were published in the 1960s the area fell into decline, with many of the buildings compulsorily purchased by the city council to allow for their demolition and the central markets moved to modern premises outside the city centre. However the road was never built and in the 1980s the decision was taken to revitalise the area and its historic buildings with the public ownership of properties allowing large scale redevelopment. The name 'Merchant City' was coined during this regeneration and was not used historically. Historically the area was called 'Trongate', 'the tron' or Glasgow Cross, 'cross' or simply by most Glaswegians 'the toun' or 'the town'. The Merchant City has been promoted and built up in recent years as a residential, shopping and leisure area, mirroring Covent Garden in the West End of London. To this end many new bars and restaurants have been established. This has been complemented with the building of prestigious new housing developments, often by restoring Victorian buildings. An example being the GPO Building development. Another important element of the area's transformation is high-end shopping, anchored by the Italian Centre, home to, amongst others, Versace Collections (the UK's first Versace store) and Emporio Armani. The Italian Centre was designed by Page\Park Architects who are fond of including art in their architecture. Here the art is integral to the façades, but also features in the courtyard including a sculpture, 'Thinking of Bella' (1994) by Shona Kinloch. Recent shopping developments include Bang and Olufsen, Bose, Escada, Ralph Lauren, Mulberry and underwear and lingerie Agent Provocateur stores. The annual Merchant City Festival takes place in September attracting tens of thousands to the area with its multi-arts programme. In 2006 Merchant City was winner of The Great Neighbourhood Award from The Academy of Urbanism. Merchant is famous for their annual festivals. Merchant city festivals have a lot of different entertainments, including street arts, dance, live music, markets, fashion and design, comedy, family events, tours, heritage walks, talks, visual art, film, and children - families activities every year. Merchant City Festival 2017 was held on 22–30 July 2017. There were two great family events as Carnival Procession and Provand’s Lordship free Family Fun Zone. Among the highlights of the festival are carnival procession from Glasgow Cathedral , massed samba bands, a UNESCO music stage, the return of SURGE, the festival within a festival, a Street band “Encontro” and a celebration of street food. During the festival, the city hosted Hip Replacement, a family Dance-along screening of Moana and Indiana Jones, and the hugely popular live sing-a-long Massaoke. ^ "Merchant City Festival 2015 - SPT". SPT. 23 July 2015. Retrieved 26 August 2017. ^ "Merchant City Festival". Merchant City Festival. Retrieved 26 August 2017. ^ "Merchant City Festival returns for a week long celebration in Glasgow's cultural quarter". The List. 22 June 2017. Retrieved 26 August 2017. ^ "Merchant City Festival 2017 Launched!". www.glasgowlife.org.uk. Retrieved 26 August 2017. Elizabeth Williamson, Anne Riches and Malcolm Higgs (eds. ), The Buildings of Scotland: Glasgow (better known as the Pevsner Guide to Glasgow). Penguin, London, 1990. This page was last edited on 6 April 2019, at 11:37 (UTC).